At 6:00 a.m. on November 12, 1958, after climbing through the night, Warren Harding, Wayne Merry, and George Whitmore pulled themselves over the edge of El Capitan, completing a 45-day siege of the granite wall overlooking the Yosemite Valley. The highly publicized first ascent of the three-thousand-foot “Nose” provided the first real challenge to the NPS’s historically accommodative stance on climbing, and once again brought the question of appropriate recreation to the fore. Requiring forty-seven days spread out between July 1957 and November 1958, the climb was a remarkable feat, demonstrating that even the highest walls in the valley could be scaled. While the conquest of the Nose sparked a broader debate over the “right way” to climb, the Park Service’s immediate concern was over the spectacle of such ascents and their impact on the environment. 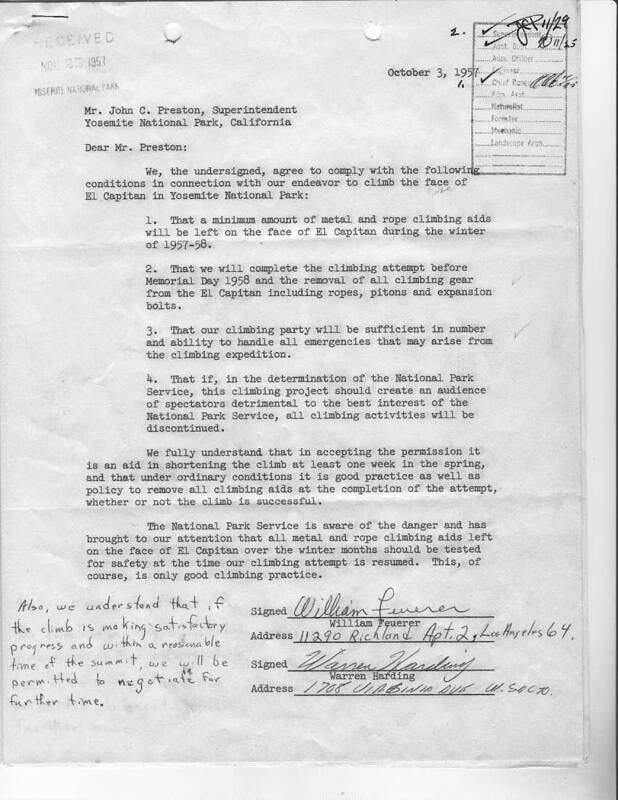 In the above agreement, signed by climbers William Feuerer and Warren Harding, the two agreed to a range of conditions concerning the time allowed to complete the ascent, their responsibility in removing any aids needed, and, “That if, in the determination of the National Park Service, this climbing project should create an audience of spectators detrimental to the best interest of the park, all climbing activities will be discontinued.”Of additional interest is the handwritten note stating, “if the climb is making satisfactory progress and with a reasonable time of the summit, we will be permitted to negotiate for further time.” Written in October of 1957, the agreement was in response to the suspension of the climber’s attempted ascent of the Nose that previous July. 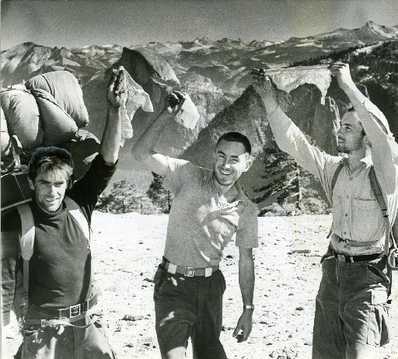 Harding and Feuerer, along with fellow climber Mark Powell began their climb on July 5, 1957. Within days, thousands of visitors began stopping to gawk at the climbers improbably dangling from high on the cliff. Curious sightseers and media crews trampled vegetation in El Capitan Meadows and caused snarled traffic jams that backed up for miles. In response to the mounting numbers of spectators, park authorities issued a request to the climbers to postpone their efforts until the fall when visitation dropped off. Despite the peak-season climbing ban, the climbers recognized the logistical problems of crowd management, and agreed to postpone their climb on July 28, picking up where they left off the following March. Such concerns motivated acting NPS director E. T. Scoyen to question whether rock climbing should remain an appropriate form of recreation in Yosemite. Writing to the Sierra Club, Scoyen indicated that the climb and its accompanying media frenzy “exerted a strong negative influence on the normal use of the park by visitors and on the normal park atmosphere. In December 1958, NPS Director Conrad Wirth, in a series of comments to the press, posed a direct challenge to the small but increasingly influential rock-climbing constituency in Yosemite, declaring that “trick climbing,” which he defined as “driving iron pitons [the metal pins that climbers used to move safely up the rock face] or bolts into a mountain,” would be banned in Yosemite. Wirth’s announcement sparked a firestorm of protest from climbers who pointed out that the proposed ban amounted to an outright prohibition of the sport since rock climbing, especially as practiced in Yosemite, depended on such devices. Furthermore, climbers maintained that the use of “a few bits of iron” where nowhere as invasive as the expansion of the Tioga Road, which Worth fully supported. In the end, climbing remained an accepted activity within Yosemite, and fed into broader debates over the appropriate use of technology in the sport and its impacts on the environment. Debates that redefined climbing within Yosemite Valley, and, like the struggle over the allowance of automobiles at the turn of the 20th century or the National Park Service’s recent ban of drone from all parks, further underlined the public’s ever-fluid concept of the purpose of national parks and what is, and is not, the right way to enjoy them.